It's his opinion; you have no right to judge. hehe, at least Sapphire Shadow got the joke. its like you learned NOTHING from this episode. I see what you did there and you saw what I did there. This episode was great! I really liked the story behind Big Mac, and it was great hearing him talk so much, that was my favorite part. I liked the whole episode. It is an origin story with only one misstake. What happens with the Apple parents? 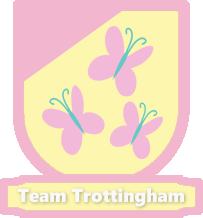 Surely Apple Bloom isn'T born right now but the parents are lost, so where are they? Alright my review is no good nswer for this. But it stated out my point of view. Am I the only one who's actually glad they didn't bring AJ's parents into this? During speculation everyone kept saying that AJ may have been responsible for her parent's deaths. Soooo many freaking terrible implications and baggage that comes with that. How can people not think that's a terrible idea? Are people really that desperate to see her parents? In full honesty I'm entirely baffled by the amount of people who expected to see her parents at all, let alone the number that wanted her to be the reason for her death? Like......sure that might be an interesting and very adult topic...for a fanfiction (fanfic writers away! 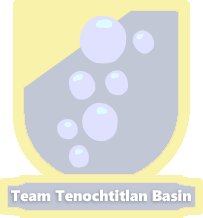 :3 I might actually look forward to those stories). But for MLP FIM that would just be a huge distraction from the entire premise of the show (friendship, and the elements that make it stronger). Not to mention that plot isn't particularly child friendly, it would cause intense retcon issues, and Hasbro would just never allow something like that. MLP was a toy brand first, tv show second, and lets be real "I killed my parents" isn't exactly going to sell well as a playset. I saw someone mention that they only read the title ("Where the Apple Lies") and....I guess I could see drawing that conclusion? But........still. And I swear this isn't to diss on people who did come to that conclusion - you're you, you saw it your way. I just didn't see that, and I don't understand how you saw that. I'm just so baffled. Also, does anyone find it interesting that despite living in a matriarchy they still go by patriarchal ideas such as taking the (in this case) Colts last name? mostly because last names aren't really a strong thing in the show. last names are the exception, not the rule. With the plot being standard for Season 6 episodes, I'm glad they actually worked around it by having it set in the past, as it allows writers to be more creative with the characters without any notion that they're being taken out of character. "Show, don't tell" was prominent here; the episode could have been more preachy and slow-paced had it not been told in flashback. The climax was a shockingly hilarious twist as well. There's a lot of comedic potential in these kinds of plots where the protagonists have to solve far-reaching problems that they create; it worked for The Simpsons Movie, after all. In visual terms, Applejack's design was cute and there are some great callbacks and references (80s Cheerilee, Derpy, and the twins from The Shining). 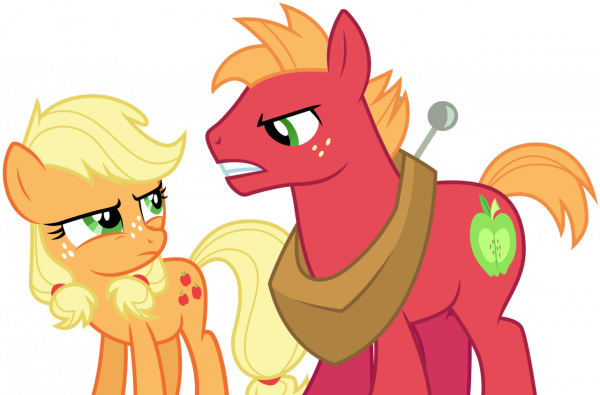 On the other hand, Big Macintosh having a large speaking role comes off as jarring and somewhat distracting to someone who has been watching this show for a while and knows these characters well. 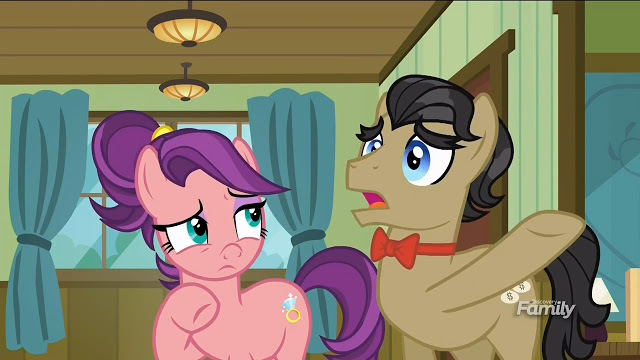 There's nothing wrong with his role in the episode, and he plays a good enough role in the plot, but any humor that comes from this contrast is pretty weak; most of it is from "holy ponies, he's talking!" or "ha ha, he got shut up again". For the most part, it implies a sort of development in the way that he knows what to say but shuts up or is forced to shut up all the time anyway ("Pinkie Apple Pie"), or that going from the extreme of talking too much to talking too little is somehow better. It only gets better if you call back to episodes like "Applebuck Season" where he knows the right thing to say even amongst his normal yes/no speech, but given his normal characterization, there really isn't much more good that comes out of it. There's also the continuity error that neither Apple Bloom nor the absentee (implied dead) parents are seen or mentioned in the flashback. This really doesn't matter to the episode's overall plot but is indicative of MLP's weaknesses as far as its no-frills writing style, weak overall concept of family, and squeamishness towards such topics. 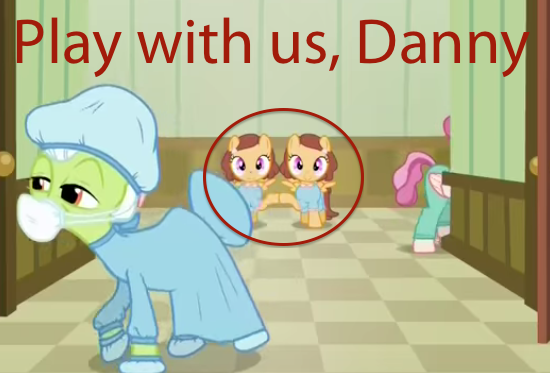 Like Big Mac's speech in the episode, such a glaring incidence is distracting to me as a long-term fan of the show and many others likewise, but doesn't really detract in any way from the main idea of the episode. It's a decent episode overall. There were a couple of noticeable flaws but they weren't enough to derail the main plot. It suddenly occurs to me that if you're anything but a unicorn you're supposed to put your mouth on those door knobs to open them. That can't be good for a hospital. I really liked this episode, it was nice to see a flashback episode focusing on one's mistakes and how you can learn from them and better yourself. Applejack and Big Mac had a fantastic brother/sister dynamic and I loved seeing them either bicker or bond over the situation. Granny Smith was fantastic as always and I enjoyed seeing her in her semi-younger years. The overall moral was well done and the references, moments and jokes were funny and heartwarming. Definitely a well done episode all around, 9/10!! Also, I love how they included wacky haired Cheerilee! No, her eyes have always been like that. They showed young Derpy in Cart Before the Ponies, remember? Yet another time where it pushes the boundaries of "a kids show". Overall, I didn't like this episode. I generally don't like episodes like this which are deliberately designed to be a cringe-fest, where we watch a character create her own problems and escalate the situation with unrelatable stupidity rather than doing the solution that's obvious from the beginning, with the audience left just waiting for the stupid character to get their inevitable comeuppance. And so it is with this episode - Applejack creates a problem for herself by promising cider that she can't deliver, and rather than doing the obvious solution, which is coming clean about it, we just have to watch Applejack make the situation worse and worse with her web of lies until, inevitably, it all comes crashing down and she has to admit the truth. Consequently, there's probably not much point in going through most of the eye-rollingly stupid things that happen which allow Applejack's ruse to drag on for as long as it did, since they were intentionally designed that way for humor and the plot structure, and I just didn't find them entertaining. I'll just point out a few things about the episode. First, Apple Bloom says she lied to Applejack about having checked what she put in the crates because she was hoping she could fix it before anyone found out. But how she think she would have done that? It hardly seems like she would be capable of secretly hauling the correct crates of jam over to Rich's Barnyard Bargains, swapping them out for the crates of cider, and returning those, all without her or the swapped crates being noticed. If Filthy Rich checks the contents of the crates as soon as he gets back to his store, then there would be essentially no opportunity for the swap to happen, anyway. 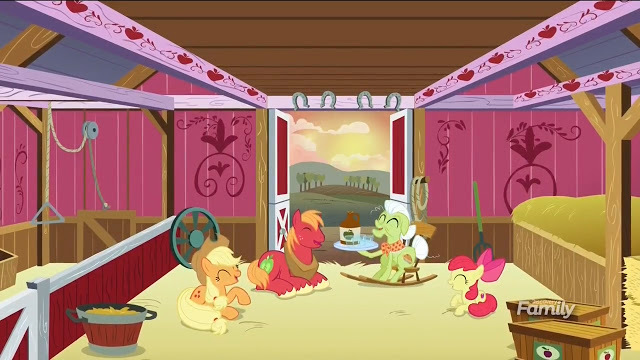 Speaking of Apple Bloom, as others have pointed out, the three Apple siblings' parents seem to be already gone in the flashback, considering that they're not seen or mentioned, and considering the talk in the episode about how Applejack and/or Big Mac are going to take over the farm someday. 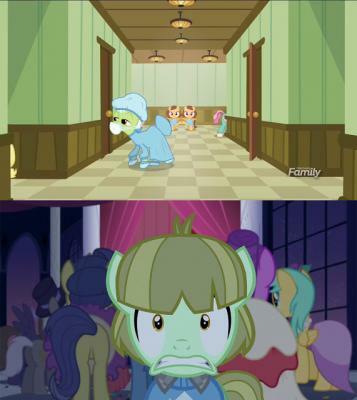 Yet, if that is the case, then we would think that Apple Bloom should be around somewhere, and yet she's never seen or mentioned in the flashback, even as Applejack, Big Mac, and Granny Smith all rush off to the hospital. 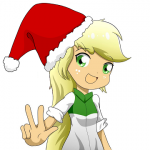 Regarding the main conflict of the episode, when Applejack proposes a "deal" of giving Filthy Rich three barrels of cider early and seeing how those sell, of course Applejack ought to know that Granny Smith is not likely to approve of that, and ought to at least say something like "Let's see if I/we can convince Granny Smith to allow such a deal". But Filthy Rich also ought to know, especially considering the conversation about how Applejack might take over the farm "some day", that young Applejack is not in charge and doesn't have the authority to unilaterally make such a deal. And so, when Granny Smith inevitably refuses to allow it, then the solution ought to be simple: Applejack goes to Filthy Rich and says something like "As much as you and I think that this is a good idea, Granny Smith has the final say and refuses to allow it. If you have any issues, we'll have to bring them up with her". I don't know what the problem would be with Applejack doing that, since it would probably deflect most of the anger and disappointment to Granny Smith. And yet Applejack intervenes specifically to prevent Big Mac from saying that for some reason, setting off the series of unfortunate events in the flashback. Finally, while Applejack wasn't in a position of authority to make a unilateral deal with Filthy Rich, I do sympathize with Applejack's thinking (at least at that time) that the Apple family should try some new ideas, particularly regarding selling their cider. We get some new information in this episode about the supposed reason why the Apple family only produces and sells cider on a first-come first-served basis at a stand on the farm. And considering what we've seen in this episode and "The Super Speedy Cider Squeezy 6000", I created a topic here making a case for why the Apple family's current system of making and selling cider doesn't make sense and doesn't work, and why I think they could, and should, change to a better system. everypony thinks that Apple Bloom voice was a bit mature this time? is Michele losing it or it has something to do with AB growing up? Did Big Mac ever stop talking? Diamond Tiaras mother always been so uptight,ha-ha, serves her right to be named Spoiled Milk by her parents... but I see why she changed it after marrying her husband. 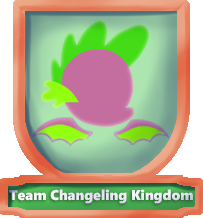 Granted, Apple Bloom is older and more mature now, but the situation was dire enough that she would probably attempt it anyway. So I doubt I'm contributing much new here, I see a lot of screen shots about things I noticed already. I will say I enjoyed the crap out of this episode. There's all kinds of questions flying now about the apple family, which I find interesting to ponder, and even more so to see the theories flying around about the parents, and where Applebloom is. Here's the three main things I took from the easter egg department though. The one pony in the bandages, I'm pretty certain is the same one you see when Dash discovers her love of reading with the broken wing. 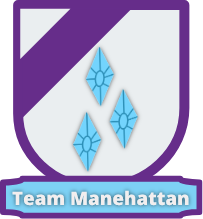 * Derpy Cameo: Ok, so everyone assumes this is actually Derpy and not anothet mare of the same colors.  We don't see her cutie mark so it could actually be a different character... but that seems a waste of a good cameo. So assume Derpy. We know from The Cart Before The Ponies that an even younger Derpy had the eye issue... so we have to conclude that Derpy is either in the hospital for an injury, or surgery related to her eyes, but not one that will fix her condition. * Apple Family: Oh boy, what a mess. Granny Smith is running the farm. AJ and BM's parents are still conspicuously absent. We can conclude they are /not/ running the farm, but oddly their children (and later 3rd child) are all heavily involved in the running of the farm. 1) The Apple parents live in Ponyville and do something else (other apple-related business?). Their children like farm work better than whatever their parents do for work. 2) The Apple parents are constantly traveling for whatever work they do, and have turned over care of their children to Granny Smith after the children are old enough. 3) The Apple parents are very near to the birth of Apple Bloom when this episode takes place and so are not working the farm. Possibly just after her birth. AB and parents are convienently absent. Very conveniently. 4) The Apple parents died shortly after AB's birth, and another member of the family (not in Ponyville) is raising infant Apple Bloom. AB joins her siblings when she's old enough not to need constant attention. #4 is actually possible in conjunction with #1 or #2. We know that the Apple parents need to have died sometime between AB's birth and season 1; and having them not present in this episode has to be explained, alive or dead. We're left with a conundrum: The Apple family heritage is very strong, and they're a farm family. If Granny's kid (and in-law) are not working on the farm, what are they doing? Why are their kids not workinv with them? If they already died, where is Apple Bloom? During speculation everyone kept saying that AJ may have been responsible for her parent's deaths. Soooo many freaking terrible implications and baggage that comes with that. How can people not think that's a terrible idea? In full honesty I'm entirely baffled by the amount of people who expected to see her parents at all, let alone the number that wanted her to be the reason for her death? Yeah, I know, he wasn't actually responsible, but he thought he was. I really don't think that dealing with a topic like this needs to be taboo and forbidden on FIM. 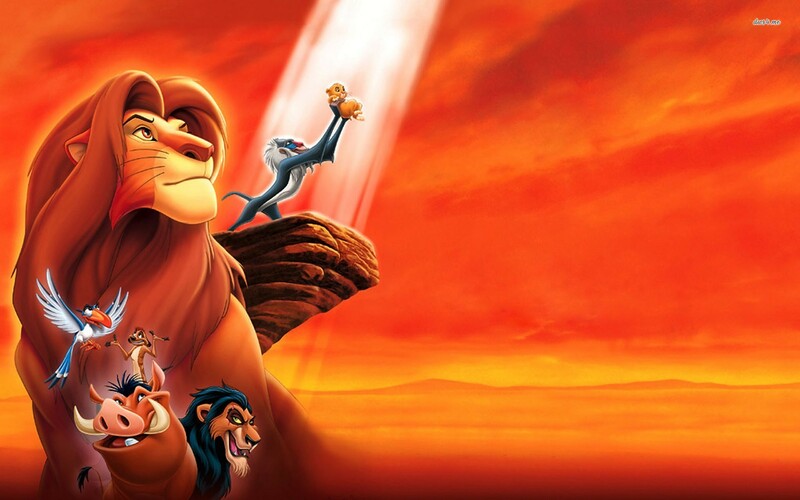 Disney does it. Why can't FIM do it? I only read the title, and honestly, that was the first thing that came to my mind, but it's probably because I'm biased and desperately want an Apple parent death episode. It also didn't dawn on me for awhile after watching that the "lies" in the title meant telling a lie. Like, duh, huh?! But I was really hoping that the title referred to where the Apples are buried, but I knew that wouldn't be the case. I live and breathe, after all. A brony can dream, though....a brony can dream! Well, that's no surprise, in the wacky, wacky world of continuity errors. 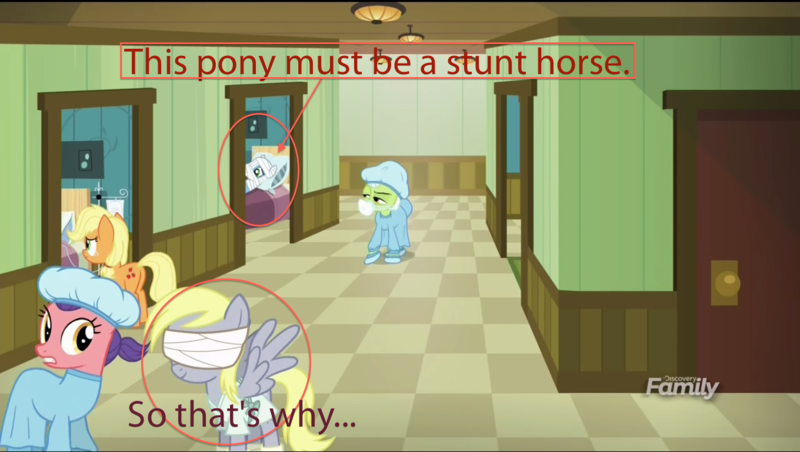 But I'm pretty sure Derpy looked to be the same age as AJ in the hospital. Just look at that picture in Midnight Scribbler's post above. She definitely looks to be the same build as AJ there. Yeah, I was surprised at that. Dang, that was pretty dark! 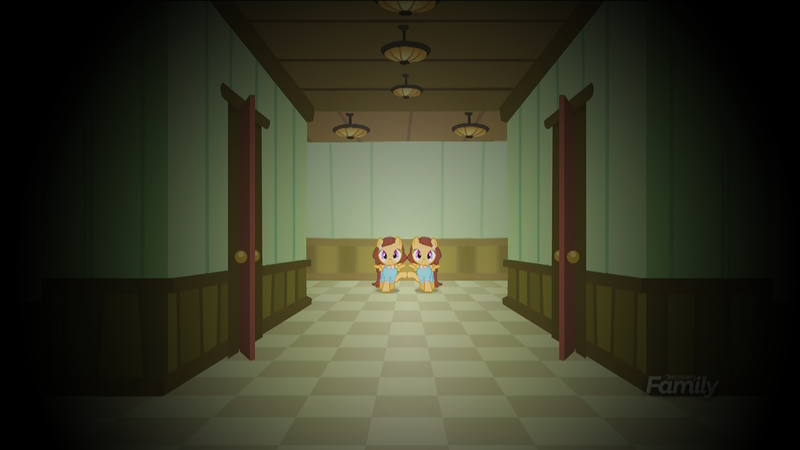 Oh yes, and I loved the Shining twins, which I forgot to mention in my main review. Yeah, thank goodness that the episode was a lot different than what many Bronies had expected. I kinda get why their parents weren't brought up. Big Mac and Granny, at the very least, remembered the tale fondly, and bringing up the fact that their mom and dad are dead would derail that. It's important to note that death has been handled on kids shows before, often making moments that were remembered by children (in a good way) for generations. The stand-out example is the episode dealing with the death of Hr. Hooper on Sesame Street. MLP has the chance to elevate itself to a new level by taking on an issue that some of the kids watching it have - why is my parent (or other loved one) never coming back? sure, but it can't be in an episode about lying. it would be disingenuous to try to get both of those things into one episode. Oh, I agree. But they still have the opportunity to do so. They still can do a "why my parents are dead" episode. Overall I thought that the episode was serviceable but not anything really special. 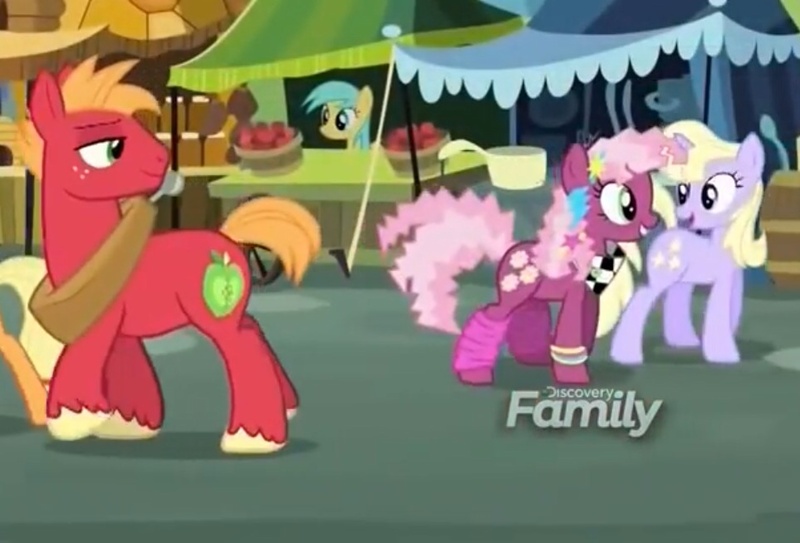 The standouts of the episode for me were Applejack's adorable hair and seeing Nurse Redheart.